Monday: 3 mile treadmill run + strength. I haven’t done strength in forever and I was already sore before I even left the gym. All from using a 15 lb. kettlebell. So crazy how your body loses strength so fast. I used to be able to squat close to 100 lbs. and now get sore after using 15 lbs. Tuesday: 4 mile treadmill run + arms. I was with my sister and she wanted to lift so we did a little arms circuit and some abs. Wednesday: NJ Summer XC Series 5K. You can read more about this race in my other recaps. This was the third time I ran it and it was pretty bad. I did a 1.5 mile warm up, ran the 5K, then a .25 mile cooldown because I just couldn’t move my legs anymore. They felt like lead throughout and I had to stop and walk a few times. To put it in perspective, race 1 was in 30:50, race 2 was in 30:13, this one was in 33:20. Yikes. I also know that part of it was just that my body was tired. I ran a 4 mile race on Sunday, and then Monday and Tuesday (see above) were workouts and/or lifting sessions. The Oakley Mini 10K is a great, all-women’s race. This is my second year running it with my mom, and I just love the atmosphere and everyone who comes out to cheer. It was a hot and humid day, and all week I was honestly dreading this race. A few days before I even relegated myself to thinking I’d just walk most of it. I know, such negative thinking. But humidity kills my runs. I have exercised induced asthma so it just makes it harder to breathe. Luckily, I got my inhaler prescription refilled (it’s been a few months since I’ve used one), and it helped A LOT! I started off super easy, around 10:45-10:50 pace and just thought, once I get over the 2 huge hills in the first 5K, I’ll pick it up. Both of those hills in the beginning are 400 meters long! My hill training has paid off because once I crested the hill I was able to speed up on the flat portion/downhill. After the hills, I started taking water breaks at each station (so from miles 3-5). I would speed up when I saw the sign for water up ahead, quickly drink it while walking, then pick it up back before settling into a pace again. At mile 6, my mom said we should do 1 minute pickups with 1 minute jog for recovery. Usually this helps us run a bit of a faster pace, so we did it. I’ve ran 1:03 in a long run before for 10K but I don’t count that. 1:07 is my new 10K race PR! I know it’s nothing crazy and ultimately I’d love to be closer to 1 hour if not less, but after the last 2 races in Central Park where I felt totally defeated, this was a great race. I’m really excited to continue training for the Chicago Marathon with Coach Marc, and I’ve been feeling great the past few weeks. It’s a lot different when you come into marathon training with base miles behind you (duh). The past few times I’ve started marathon or half marathon training, I’ve come into with zero base miles. Next up is the Achilles 5 Miler, once again in Central Park…need to do those 9 NYRR Races to qualify for the 2016 NYC Marathon! Who else is running Chicago Marathon? Or a big fall race? First off, you may (or may not) notice that I am not starting off Monday with my usual Monday Motivation posts. I think I’m going to retire those for now. But I do plan on replacing with weekly training recaps now that I will start running more and training for some more races, especially a half marathon! Do you guys like reading others’ training recaps? Anyway, this weekend I ran the Oakley Mini 10K with my mom. It was our first NYRR race of the year…and it was awesome! We were not trained for this at all. We haven’t been running much. I mean, we’ve still been exercising daily, but it’s consisted mostly of lifting, and cardio workout videos. It’s been fun to switch things up. So yeah, I knew going into it that it’d be tough. But I was excited because it was also our first 10K! I think I was a bit too excited though because I only for 4 hours of sleep the night before. I could not fall asleep for the life of me. I even tried following my own sleeping tips. Nothing worked. At least I wasn’t going for a PR or anything or else I’d be even more frustrated. Our way up the west side was a steady, slight incline the whole way…pretty much a mile. Even though the park is known to be hilly, I was excited to enter the park so get some rolling hills. I felt fine until about 3.5 miles. Around 3 miles my mom was pulling away from me. She felt good so I let her go…though I wish I had brought headphones, because it was about to be a rough rest of the way! Right before mile 4 I got a little dizzy. It was weird. So I stopped to walk through the water stop. After that came a pretty significant climb. I walked up that hill, probably for a good 2-3 minutes. I was feeling defeated, but then I told myself to get over it and get moving. From mile 4-6.2 I decided to do intervals. I knew I couldn’t hold a steady jog at a consistent pace, so I started running as fast as I could for 1 minute, then walking for 1 minute. Hey, I was still doing some miles around 10:45 so I’ll take it! At mile 5 there was a pretty big cheering crowd so I got pumped up and tried to run as far as I could before walking again. Then I saw a sign for 800 meters to go and started running. I told myself I’d run to the end. I saw my sister right before the finish line and tried to speed up (to no avail). I was beat! I crossed the finish line though! Completed my first 10k! My mom finished in 1:03 and I’m so proud of her! She had minor surgery in May and was not able to exercise for a month, so she has only been running for a few weeks. I finished in 1:08. 11 minutes per mile. I’ll take it for not being prepared. Plus, it was my first 10K so it’s automatically a PR right??! It was such a great race. 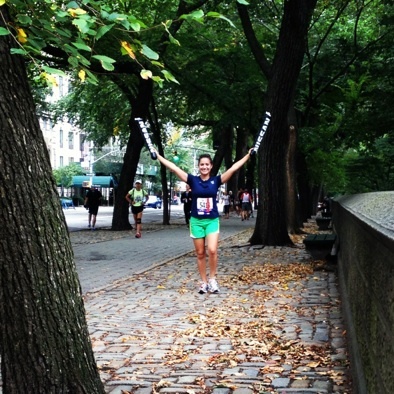 The crowd support really helped throughout the tough hills of Central Park. The all-women atmosphere was inspiring. It just felt great running with about 6,000 other women on a Saturday morning. At one point, this woman told me it was her first time ever running 6 miles…good for her! 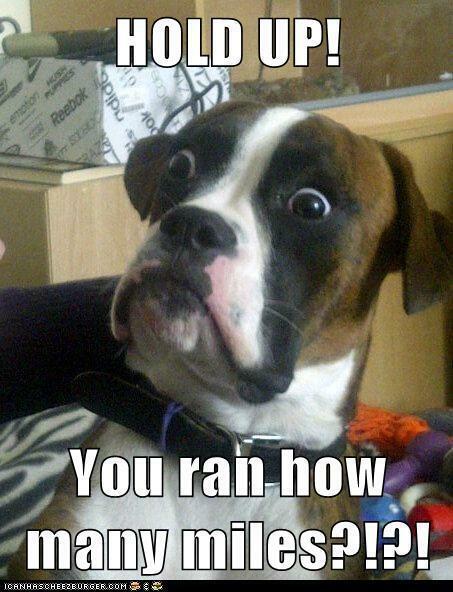 Oh, also one last random question. I saw this woman (who was wearing a birthday girl sash) right at the end with 400 meters to go. She started to walk, and I wanted to tap her and say, “Come on let’s bring this in together!” But I didn’t know if that’d be considered supportive or creepy? What do you think? I know I’d like it and it’d get me to push myself ’till the end. Thoughts? Okay, sorry for such a long post, but it was just a great day. Can’t wait to complete our other 8 races so we can qualify for the 2015 NYC Marathon! Did you run the Oakley Mini 10K? What did you think? These are both new things my mom and I have added to our Etsy shop! You can find a detailed background about why we started the shop, and our mission here. In short, my mom and I started this shop with the goal of helping the charity, Manitos. Manitos aids children diagnosed with cancer in the South American country of Paraguay. There is only one pediatric cancer center in the country, and Manitos helps provide the simple things we sometimes take for granted, like bowls and silverware…and even meals, since they can only afford to feed the children once a day. We decided to donate 10% of each sale back to Manitos. And since we are going to Paraguay this summer, we’d like to visit the hospital and see how else we can help. The skirt is made of a more flowy, leightweight, tulle material, so you don’t feel it at all while you’re running. You can find more information here, on our Etsy page! We have also added in more pillows. How many race t-shirts do you have? Why not make them into a throw pillow to display on your couch or bed? You send us your shirts, and we will show you some fabrics that would match, then make it all into a pillow! Please let us know what your thoughts and feedback are, as we are always looking to improve and add more to our store! Have you worn a running skirt for a race? Or a costume of some sort? I can’t believe we are almost done with week 10. Since we are more than halfway there, I wanted to take some time to reflect on how training is going. As you know, my mom and I have been using the Hansons Marathon Method to train for the NYC Marathon. Here are some thoughts. It actually hasn’t been bad at all! When I first read this plan I was so nervous. Running 6 days a week?!!? I hadn’t done that since high school cross country. I have shin issues…would this be a good idea? The most I have ever ran in a week was 37 miles during marathon training in 2011. We will be running close to 60 miles during peak weeks and have already ran over 37 weekly miles…and ran the most in a year EVER! It hasn’t been bad at all. Yes, I am tired some days, especially after harder days, but I look forward to each run. Running 6 days a week hasn’t been bad at all, and in fact, my shins have been hurting less than in other training bouts…did running MORE help?? They’ve been tough at times but I look forward to the hard days (track workouts, tempo runs, and the long run). We had an awesome tempo run yesterday which actually made me feel confident that we will be able to do way better this marathon. While I’m a little scared of the fact that the longest run we will do is 16 miles…I am trusting the plan and the science behind it. I definitely feel fitter! We are feeling good. We have some aches and pains occasionally as is expected. I am still practicing with fueling on long runs. Currently, I’m taking half a GU every two miles with 4 oz. of water. I think I need more though, from what I read, I should take 1 GU every 25 minutes, and drink 2 oz. of water every 15-20 minutes! I will try this on my next long run. Fueling is what killed me next time so I need to do better with this. Are you training for a half marathon or marathon this fall? How is your training going? Tell me, I’d love to hear about it! Hi everyone…sorry to be MIA! I know today I usually post my “Health/Fitness Links” but I have been so busy. I was at a digital summit all day yesterday with my sister, so I had no time to write anything. I will be in NYC again tomorrow, have a reception Friday, my HALF MARATHON Saturday (!! ), and graduation Sunday. Needless to say, I will be happy when this week is over lol. Here’s a pic of us from yesterday…it was a great day and we learned so much to start expanding and improving our business! I will be back to our regularly scheduled programming next week, I promise! 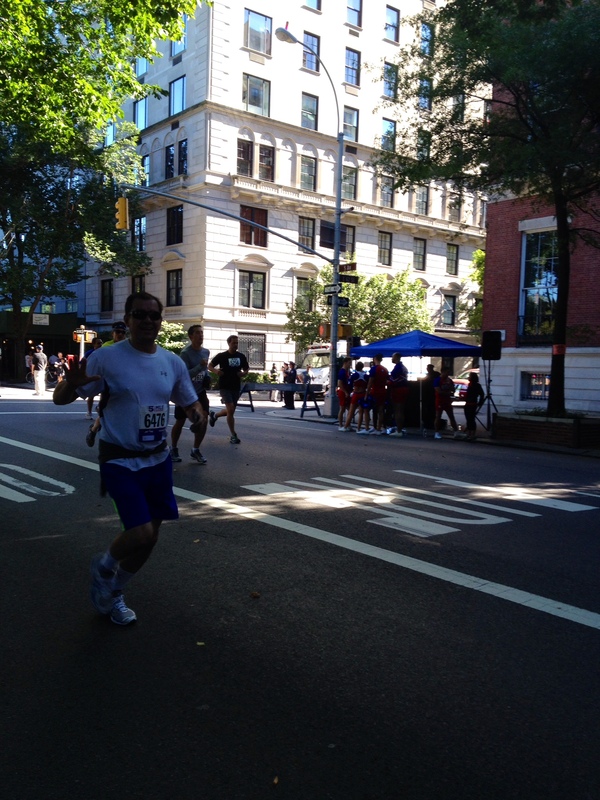 On Sunday, I ran the NYRR Run as One 4 Miler in Central Park. The goal was to do it in half marathon goal pace, so around 9:00 minutes per mile. I ended up averaging 8:50-ish per mile!! It was challenging BUT more like “comfortably hard,” instead of really hard. NYRR has my average pace at 9:05 per mile, but my Runkeeper app (and my mom’s) said we ran 4.2 miles and at a faster pace. I figured it was the tangents, etc. but a fellow runner tweeted at me that he had the same issue with his Nike app and his Garmin, and that others were commenting on this issue as well. They had new B-tags for this race so maybe that was the issue? Either way, I’m going with my Runkeeper time! Overall, it was a great day to run! Beautiful weather and I felt awesome. The hills didn’t really phase me either, I really felt like I was powering through them. Hopefully my successful long run, and this great race bodes well for May 18! Yesterday, I started the day off by going to the Rutgers Unite Half Marathon in the morning. My half marathon training group was running and I wanted to go support them. It was great being a spectator for once and taking the race in! It was on the chillier side but a great day for racing all around. I left early then headed back home to start warming up for my 5K which was at noon. My mom and I did some dynamic warm up drills, and jogged the 1 mile to the park where the starting line was. It’s so convenient having a 5K right in your town! The course has 2 major hills and a few small ones, so it’s tough. I finished in 27:26, which isn’t my best and I really wanted to PR but you can’t always get your best time! Overall, I felt really strong and my pacing was even, so I am happy with that. Plus, I did get 2nd in my age group! Mom and me at the finish. It was a great day, and at least it wasn’t rainy like it was last year! This race always has great post-race food so we had a bagel, then headed over to the lunch tent where there were a ton of burgers, hot dogs and desserts. Yum! Afterwards, we did a cooldown mile back home. I was exhausted and ended up taking a 2 hour nap as soon as I got home. Those post-race naps are the best! My next race is this upcoming weekend. It will be me and my mom’s first NYRR race of the year – a 4 mile run in Central Park to raise money and awareness for lung cancer. My running coach had me doing a 4 mile tempo run this week, so I figured I’d sign up for a race to make it seem easier/give me more motivation. Less than 1 month until a) the Brooklyn Half Marathon and b) I graduate with my Master’s degree!!!! What spring races are you doing this year? 1. Best Race Experience: I loved all of the NYRR races this past year (me and my mom’s first year with NYRR). But my favorite was definitely the 5th Avenue Mile. 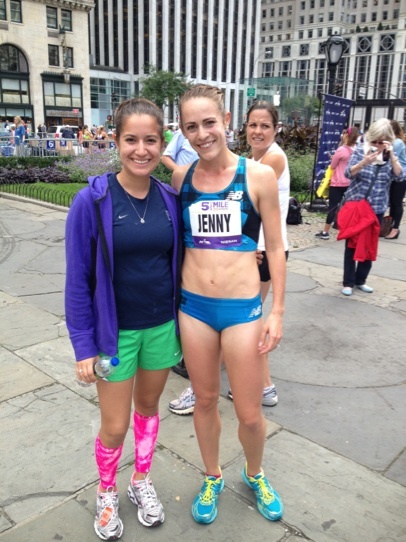 I had an awesome race, it was so thrilling running 1 mile down 5th Ave, and I chatted with Kara Goucher and Jenny Simpson. So excited to chat with Kara! 2. Best Run: I can’t pinpoint one specific training run that I loved, but I know that running in the fall was my favorite time. 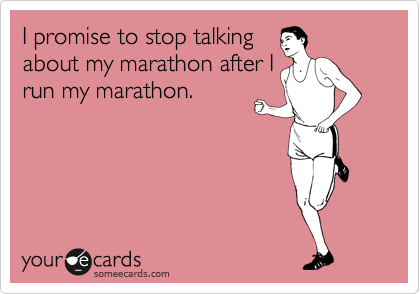 This year especially because I wasn’t marathon training in the fall. I was able to really enjoy my fall runs without worrying about distance and pace. Who doesn’t love fall scenic runs like this? 3. Best piece of new gear: Nike capri pants. I always said I’d never wear capri spandex to run or the gym. I thought it’d be too hot, so I always wore shorts. Now I love capris! 4. Best piece of running advice: Hmmm, I will go with my running coach Marc. He pushes me to work hard and not make excuses. I’ve been training him with 2 years now, crazy! Whether it’s advice about pacing, races, shin splints/injuries…he is always responsive and helps me out. 5. Most inspirational runner: I’d have to say Dorothy (from mile-posts). I only recently stumbled upon her blog but she has run 20+ marathons! She truly inspires me to work hard and chase my dreams. Her mantra of “I Run This Body” is one I repeat to myself in races, and a good reminder that a lot of it is all mental. 6. If you could sum up your year in a couple of words, what would they be? Exciting…successful…relaxed….and marathon qualifier because my mom and I completed the NYRR 9+1 races to automatically qualify for the 2013 ING New York City Marathon! Anyway, my mom and I were excited this was the last race we had to do. Don’t get me wrong, I have loved running in NYRR races, but it’s getting cold and driving back and forth to NYC every few weeks is $$$$$. That morning was pretty cold when we got to the park (35 degrees I believe), but we started jogging and warming up, so once the race started it wasn’t that bad. I told my mom we’d start off easy and feel it out. I wasn’t sure if I wanted to run this race faster to test myself out, or take it easy. My last race of the year is Dec. 8 (5K), and I kind of wanted to see what pace I could run 4 miles in. After a mile, I was feeling awesome, so we decided to run a bit faster. We weren’t going 5K pace by any means, or close to our max, but it definitely wasn’t an easy, comfortable pace! I felt really strong, even going up those Central Park hills. As my RunKeeper app told me my splits, I knew I would get a PR or close to a PR in the 4 mile. I was just excited I was feeling awesome! OH WAIT. I have no idea because my D-tag didn’t work for some reason so NYRR didn’t post my results. Sad. Luckily, I was using my RunKeeper. Actually, it’s pretty weird that happened at the ONLY race I was using my GPS tracking app. Good thing I did! The only downside is, that the final distance said 4.1 miles, not 4. It’s common for GPS watches and apps to be a little long during races, because most people don’t run the tangents of the course (which is how courses are measured out). Therefore, I have no clue if I officially PR-ed, but I’m guessing that since my 4.1 mile time is the same time as a previous 4 mile time, that I did get my best time. My guesstimate is 35:45. It was a beautiful day in the park and the perfect temp. It was in the 40s but once we warmed up we were actually wishing we didn’t wear our cold gear tops. What’s your next road race?